Today I am really excited to share a purse review of Gucci Dionysus Leather Super Mini Bag ($830, Made in Italy). I got this bag from Gucci store at Dubai International Airport earlier this year. I am sure many of you may know about the Gucci Dionysus bags already and how popular they are. 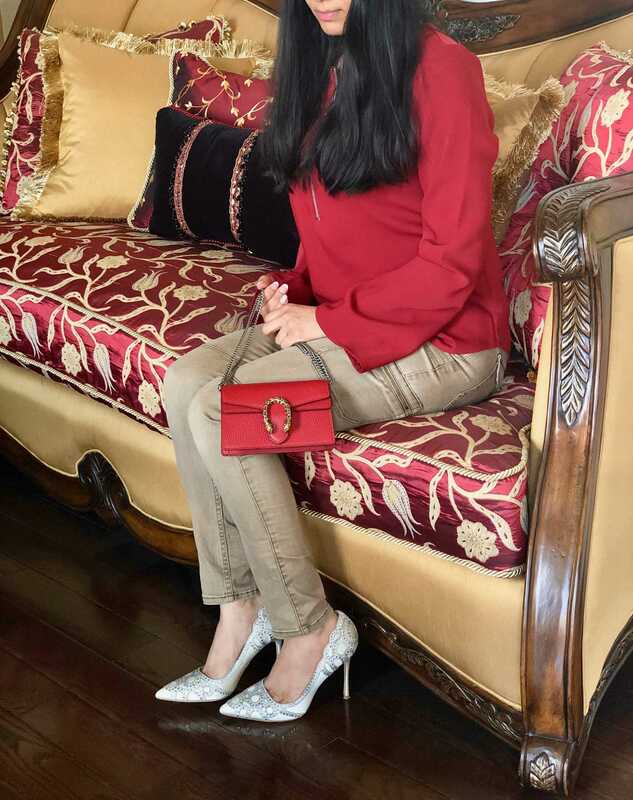 The Dionysus collection comes in loads of different sizes, colors and fabric/leather options, the super mini is the smallest version I picked in Red leather. You can see the full Dionysus Collection in US here. 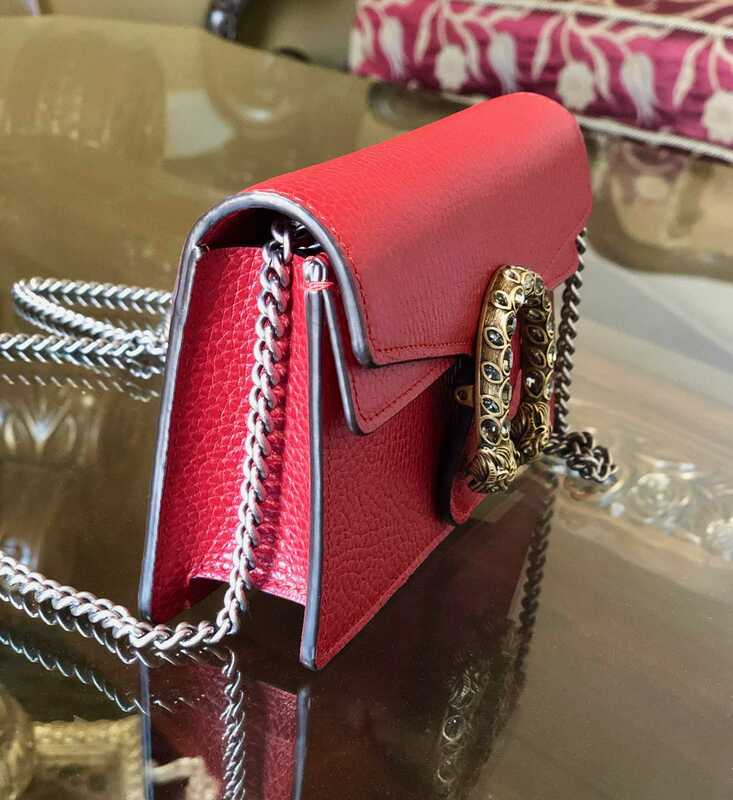 This bag is made in resistant textured leather, rectangle in shape and has a long removeable weighty chain strap, a flap front with a Dionysus clasp to it. It also has a removable key ring which can be attached to any other bag OR can be used to attach this super mini bag to a separate larger bag. Chain strap and key ring are in Palladium-Toned metal. It has a pin stud closure with side release, closes securely with force. The tiger head clasp refers to a Greek God Dionysus. Rose gold tiger head clasp is enriched with Swarovski crystal stones. It is made in Italy and cost $830 USD which is quite reasonable price for a Designer bag like Gucci. Main flap opens up to inside of the bag which is just one compartment and doesn’t have any slip pocket or sections in it. Please note It doesn’t have any exterior pocket under the flap like Dionysus mini leather bag has. As the name suggest and I mentioned above Dionysus Leather Super Mini Bag is the smallest version. It measures 4 inches/10.2 cm high, 6.5 inches/16.5 cm wide and depth is 1.5 inches/3.8 cm. 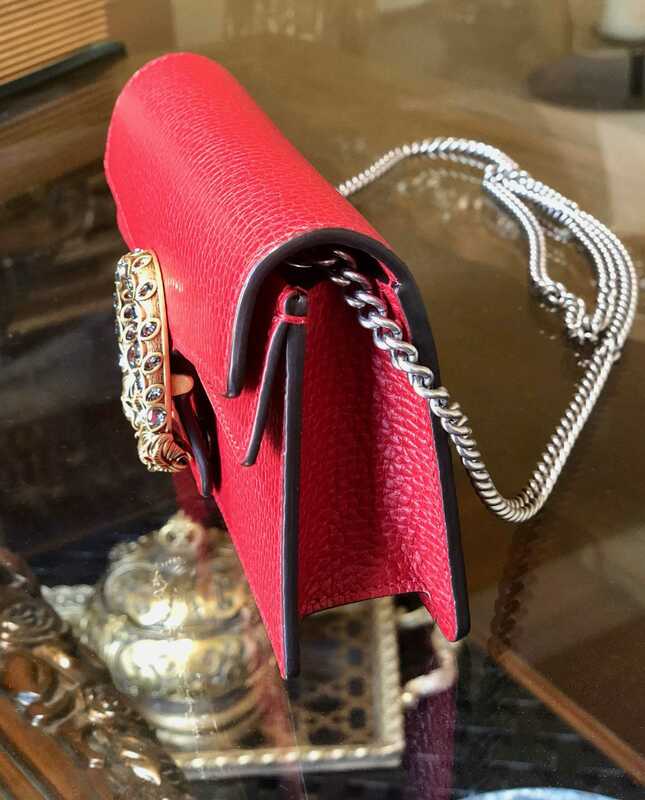 Chain shoulder strap length is 23.5 inches/59.7cm. Interior capacity is extra small that iPhone X plus will not fit in it. It fits my iPhone X regular, ID/credit cards, lip gloss and lipstick, cash and a car key. Style of this bag is super cute and stylish. It can be worn multiple ways. 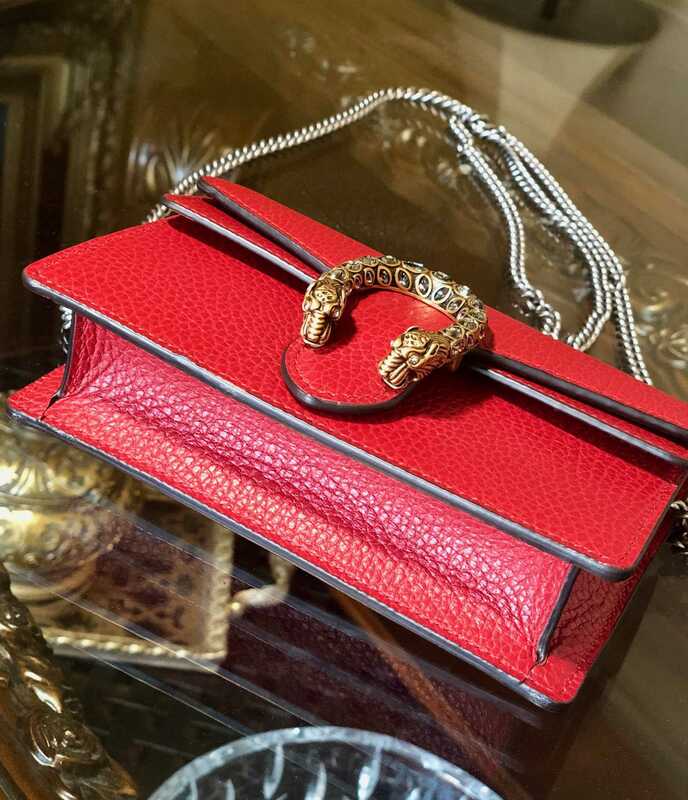 The chain is long enough to be worn as a crossbody or wear it full length on one shoulder. Chain can be doubled to wear it as a shoulder bag with shorter length. I can also use it as a clutch with or without chain. 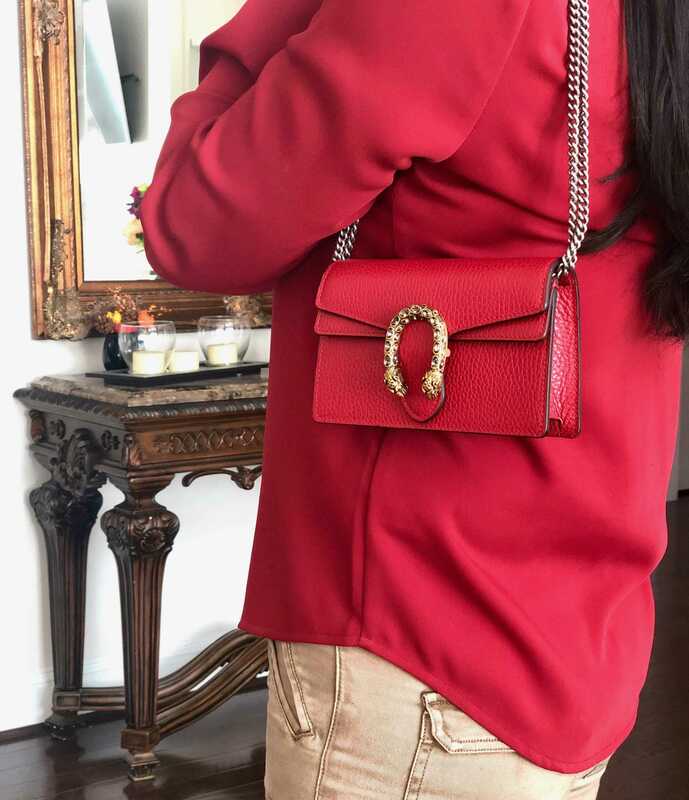 Gucci Dionysus Leather Super Mini Bag in same Red color is available at Saks Fifth Avenue, while in other colors, sizes, style and fabric options available at Gucci, Nordstrom, Neiman Marcus and Farfetch.